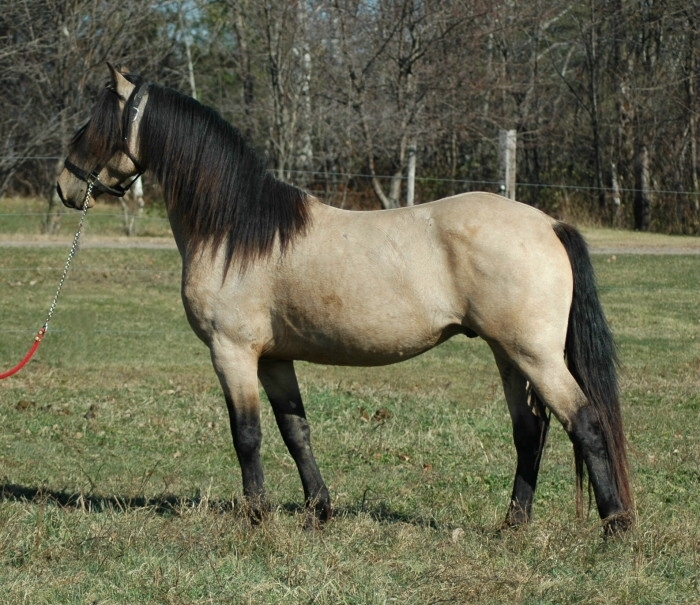 Scroll Down for more sale horses with thumbnail photos. Scroll to the very bottom of this page for important information on DNA, registries and pedigrees. Prices are subject to increase, as training progresses. 2013 Foals: 3 new foals have arrived at Legend Woods! Visit HERE to see Legend Woods' Facebook updates on the 2013 foals! (1) Un-nammed, Black LP, 50% Friesian/Appaloosa Filly. Black now, but will develop lp roaning and possibly lp spots. Sired by Legendary Design and out of Nero's Final Design. Both parents were inspected High Merit! $4,500. 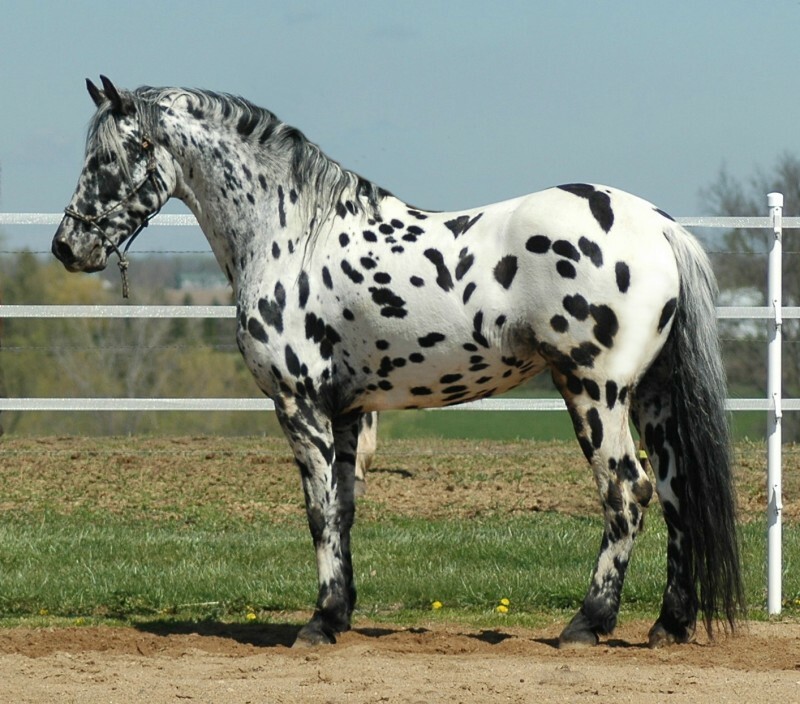 (2) Un-nammed, Bay LP/LP, 50% Friesian/Appaloosa blanket Colt. Sired by Legendary Design and out of Nero's Independant Design. Sire inspected High Merit (dam not yet inspected). Tested homozygous black and homozygous LP! E/E A/a LP/LP $4,500. (3) Un-nammed, RARE Black Silver Dapple Friesian Heritage (25%) Colt. 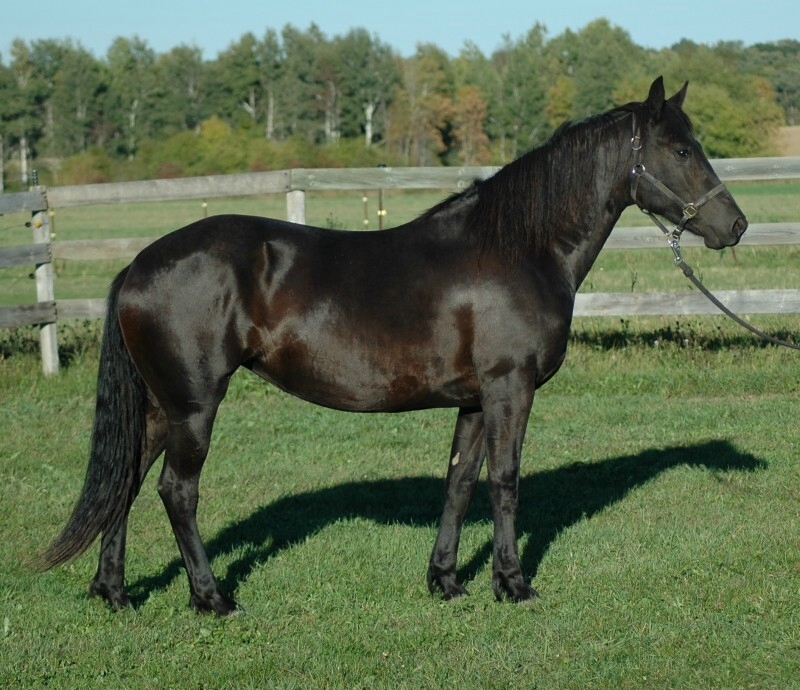 Rocky Mtn/Friesian-Standardbred Colt. Sired by Sterling Spyder and out of Legend Woods Tirzah Reeshon by Nero. Both parents were inspected High Merit! Will mature well over 16 hands! $10,000. (1) Un-nammed, Ellio x Trinity Filly, Bay tobiano, 2nd Premie, Friesian/Paint Filly, born 6/11/12. 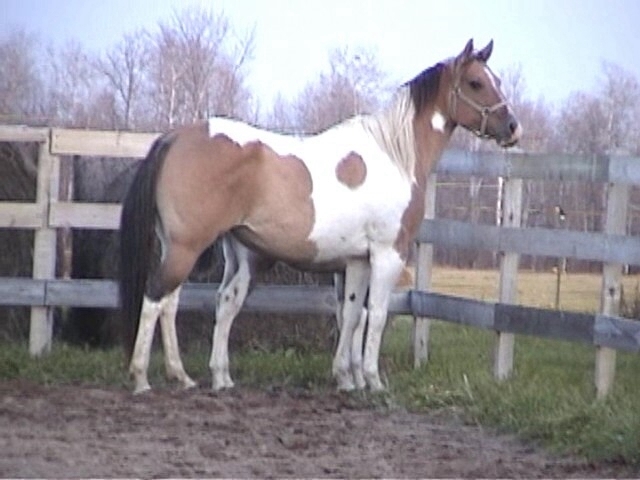 Sired by Ellio of Legend Woods by Nero and out of APHA mare, Trinity Gold. Full sister to Trinelle (below). $3,200. (1) Carbonaat de Creme LW ("DJ") (click here for photos): Rare Buckskin Champagne (aka: amber-cream champagne) Friesian Heritage (25%) Pony colt/gelding by Billy Elliot Norsk (15.2) by Ellio, and out of 13.1 hand pony mare, Amber. Color tested Ee, AA, with one copy of cream and one copy of champagne! Half brother to Doubly Bubbly! Add some carbonation to your barn! This boy can move! Inspected 2nd Premie as a yearling. At 25 months, DJ is already near 14 hands and 700lbs. Watch DJ's video here! $3,500. (1) Trinelle of Legend Woods Bay tobiano, 2nd Premie, Friesian/Paint Filly, born 6/17/2010. Sired by Ellio of Legend Woods by Nero and out of APHA mare, Trinity Gold. $5,500. - in training, as of June 2013, for driving and light introduction to saddle. New photos & video coming soon! (1) Darcella of Legend Woods Solid Black Friesian/Appaloosa Filly. Sire: Darkest Design by Dante Dam: Indi by Nero. $3,500 - in training, as of June 2013, for riding and driving. New photo here & video coming soon! (1) Ellena of Legend Woods Bay turning Gray, Friesian/Percheron-QH Filly. Sired by Ellio of Legend Woods by Nero and out of a Percheron/QH mare, Molly. $5,500 - in training, as of June 2013, for riding and driving. New photos here & video coming soon! All horses above are 50% Friesian, unless otherwise noted. Prices are subject to change at any time, especially as training progresses. Please E-mail for more info and pictures of the horses listed above. Nero's Independent Design (Indi) 2003, Buckskin, Friesian/Appaloosa Filly by Nero - Retained for breeding (her 2009 black filly, Darcella, by Darkest Design by Dante is for sale - see top of sale page. Please email us at legendwoods@msn.com to request video clips of specific horses. All of our sale horses of Friesian Heritage are registered with the Friesian Heritage Horse & Sporthorse International (HH). Some of our horses are also registered with the Friesian Sport Horse Registry (FSHR) and the Friesian Blood Horse Registry / Friesian Cross Registry (FBHR or FXR). Although some of our horses hold FSHR papers, since the change in management/ownership of the FSHR occurred in 2008, along with a repealing of the former DNA requirements, we no longer endorse the Friesian Sport Horse Registry (FSHR). All horses of 25% to 100% documented Friesian Heritage are eligible for registration with the the Friesian Heritage Horse & Sporthorse International (HH). All of our currently producing broodmares and stallions of Friesian Heritage are parentage DNA tested and furthermore are VERIFIED against their parents of Friesian Heritage!! With the scams that unfortunately abound in our world today, not to mention the honest mistakes that inevitably occur in breeding and record keeping, this testing and verification is vitally important to maintaining the integrity of the bloodlines!! 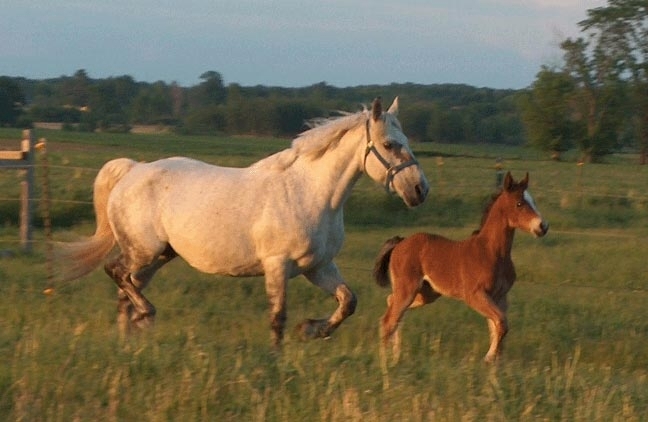 Whether you decide to buy from us, or another farm, we strongly recommend, for your protection, that any horse that you consider for purchase should be registered, DNA tested and verified for parentage. Please keep in mind that a DNA test without parentage verification proves NOTHING about the horse's bloodline, except that the animal has DNA, and some registries do not implement DNA at all, much less actual verification of identity through parentage testing. Pedigree Note: On each page, for most of the horses, there is a thumbnail for pedigree. When you click on the pedigree thumbnail, a larger version of the papers pops up in a new window. If it is too small to read, you can simply drag the edges of the window to get an even larger view that should be readable.